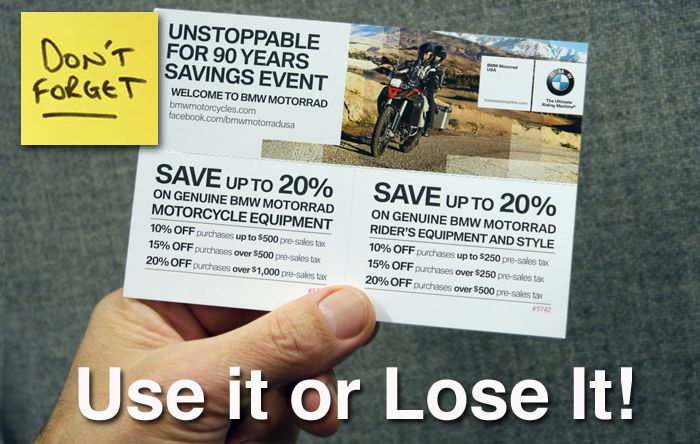 BMW’s UNSTOPPABLE Accessory and Riding Gear Savings Offer Ends March 31, 2014! You saw what’s coming from BMW in 2014 at the International Motorcycle Shows across the country; locally motorcyclists attended the Washington, DC International Motorcycle Show and Timonium Motorcycle Show. Did you attend either show? Maybe both? If so, you should have received one of these amazing, limited time ONLY coupons (pictured above). So NOW it’s time to take advantage of the valuable (serial numbered) coupon you received at the show! This exclusive offer ends this month and will NOT be extended. Purchases must be made IN-STORE ONLY… these are BMW’s rules and we can’t change them; we simply want to remind everyone out there this offer is ending SOON and you don’t’ want to miss out! If you got the coupon at a show and lost it, then start looking; photo copies or a print out of this email may not be used under any circumstances. If you’ve honestly misplaced it please let us know and we’ll at least see if we can help in some manner but there is no guarantee as we can’t print these out. We had one customer whose dog really mangled his badly, it was almost unreadable but we made it all work in the end and followed the rules. Our biggest disappointment came last year when a good number of these were never redeemed at Bob’s or any other BMW dealership for that matter. Seems a shame to let an opportunity like this slip away so easily. With saving up to 20% off genuine BMW accessories you don’t want to hesitate. This is all the cool stuff that fits older BMW’s you may already own or the very latest machine from BMW like the R9T or a water cooled R1200GS, R1200RT or maybe even a new S1000R that in some cases may still be on the water for customers awaiting their newest BMW – it’s good for all of them even if it’s paid for and awaiting delivery of your bike so we can install it next month or even in May or June! Tank bags, saddlebags, GPS units, cylinder guards, different seats or windscreens, bag liners, top trunks… the list goes on and on as long as it’s genuine BMW stuff. And don’t forget that this offer is actually two parts because you can also save up to 20% on any genuine BMW riding gear and apparel. Think about that – the newest gloves, boots, under layers and of course jackets and pants or even a new BMW rain suit can all be had for up to 20% less at Bob’s, with your show coupon. But remember, you’ve got to bring that valuable coupon to Bob’s because BMW will not allow any mail order or e-commerce orders to be fulfilled. If you just can’t make it in, send your best friend with your coupon to buy the stuff you want and be a sport and tell them to buy something he or she needs too. So jump on our website or BMW’s website and do some pre-shopping and then get back on your bike or even in your car and make it to Bob’s to use your show coupon and save some money between now and Monday March 31, 2014 when this offer ends!